Two render elements are always present: Beauty and Alpha. Some render passes differ in the standalone and 3dsmax versions of Corona. This article primarily describes the 3dsmax render passes. There is a separate description of the standalone passes. These render elements are used primarily for masking individual scene elements for postprocessing. They are all rendered even when using “Render elements only” function. CShading_Albedo No Shows the albedo (total reflectivity of the surface - the fraction of energy that is reflected in any way from the surface) of the scene surfaces. Scenes with too high albedo can cause problems - washed-out look and excessive render times. This pass can be used to quickly spot and fix problems - typically if your walls/floors/ceilings are shown in red, lowering their brightness will speed up rendering. Note: red does not automatically mean bad. Only problem is red on large, diffuse areas, like walls. For more detailed guide, see: What is albedo? How to use it? CShading_Components Yes This versatile render pass allows selecting custom subset of lighting components. 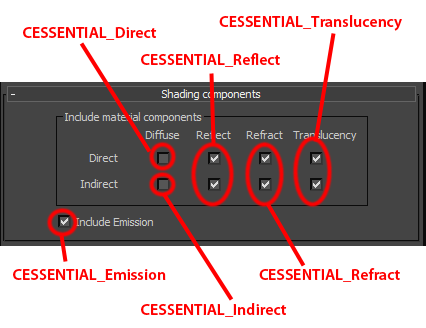 It can add diffuse, reflect, refract, and translucency lighting, in both direct and indirect (GI) variants. The basic decomposition passes can be recreated using this pass (see: this illustration), or it can be used for finer division (e.g. separating reflect direct and indirect lighting).